USPA NEWS - The First Canadian Edition of the Airbus Foundation Flying Challenge has been launched in Québec, in Partnership with the Mirabel Youth Centres Association – bringing theTtotal Number of Sites conducting this Flagship Program of the Airbus Foundation to 17 Worldwide. The Airbus Foundation Flying Challenge is a Youth Activity and Mentoring Program involving 50 Local Students to interest them in Aerospace and raise their Awareness about Training and Future Employment Opportunities in the Field. The First Canadian Edition of the Airbus Foundation Flying Challenge has been launched in Québec, in Partnership with the Mirabel Youth Centres Association – bringing theTtotal Number of Sites conducting this Flagship Program of the Airbus Foundation to 17 Worldwide. The Airbus Foundation Flying Challenge is a Youth Activity and Mentoring Program involving 50 Local Students to interest them in Aerospace and raise their Awareness about Training and Future Employment Opportunities in the Field. The Planned First Year of Activities of the Mirabel Airbus Foundation Flying Challenge include Visits by Participating Youth accompanied by Local Airbus Employees to the A220 Final aAsembly Line in Mirabel, to the École Nationale dAaérotechnique (ÉNA) in St-Hubert and the Cosmodôme in Laval. There will also be Various Conferences and Workshops including STEM (Science, Technology, Engineering and Math) Activities. AnotherIimportant Aspect of the Airbus Foundation Flying Challenge is to create Mentoring Opportunities between Airbus Employees and Local Young People who are Potentially Interested in a Career in some Sspects of Aeronautics. "The Airbus Foundation is committed to bringing together all of its Resources to help address the Challenges of Society Today and Tomorrow. One of our most important Projects is the Airbus Foundation Flying Challenge to engage Young People and encourage both Personal and Professional Growth through STEM Activities," said Andrea Debbané, Executive Director of the Airbus Foundation. "We are very pleased to be expanding the Airbus Foundation Flying Challenge with this pPogram in Mirabel to add to those already operating in France, Germany, Spain, the UK, the USA and Brazil." Thanks to CDN$45,000 in Funding from the Airbus Foundation, the Mirabel Program will be managed by the Mirabel Youth Centres Association, which operates Six Youth Centres throughout the Mirabel Community. The Association also recruits the Participants. 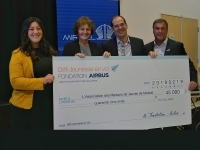 "We are very excited to be able to offer the Airbus Foundation Flying Challenge & its Stimulating Activities to the Young People of Mirabel & we thank the Airbus Foundation for bringing this Opportunity to our Community," said Sabrina Abdeddaim, Director General of the Mirabel Youth Centres Association. "We are sure these Bun but Very Educational STEM Activities will inspire some Young People to consider Seriously what they need to do to pursue one of the many Possible Careers in Aerospace." Running since 2011, the Airbus Foundation Flying Challenge has reached more than 4,800 Students Worldwide & involved over 1,900 Airbus Employee Volunteers. The Program is now operating out of 17 Locations across Seven Countries. * Photo: The Airbus Foundation Flying Challenge launch event where a cheque of $45,000 was presented were, from left: Sabrina Abdeddaim, Director General of the MYCA; Marie-Claire Certiat, Director of Programs, Airbus Foundation; Philippe Balducchi, CEO of the Airbus A220 Partnership & Head of Country Canada, Airbus; & Mayor Jean Bouchard of Mirabel.